Atmel Power Debugger is a powerful development tool for debugging and programming ARM® Cortex®-M based Atmel® SAM and Atmel AVR® microcontrollers using JTAG, SWD, PDI, debugWIRE, aWire, TPI or SPI target interfaces. In addition the Atmel Power Debugger has two independent current sensing channels for measuring and optimizing the power consumption of a design. 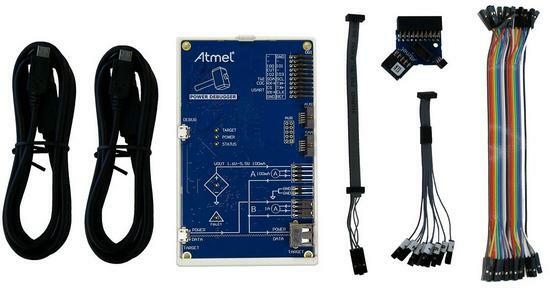 Atmel Power Debugger also includes a CDC virtual COM port interface as well as Atmel Data Gateway Interface channels for streaming application data to the host computer from a SPI, USART, TWI or GPIO source. The Power Debugger is a CMSIS-DAP compatible debugger which works with Atmel Studio 7.0 or later, or other frontend software capable of connecting to a generic CMSIS-DAP unit. The Power Debugger streams power measurements and application debug data to Atmel Data Vizualiser for real-time analysis. Two independent measurement channels measuring both voltage and current simultaneously — One high resolution channel that can measure 100nA to 100mA and one lower resolution channel that can measure 1mA to 1A.